Minx nails are an excellent alternative to long lasting nails that will withstand the everyday tasks while making your hands look beautiful. Our minx nail services in NYC are perfect for those who want highly customized nail art to stand apart from the crowd in today’s world. We use a natural non-toxic flexible polymer so that our minx nails that will remain the color you choose and never peel, fade, chip, or crack. Minx nail treatment and services are safe for everyone including women who are pregnant as well as women who sufferer form allergies. We are currently one of the only Minx Nails New York City providers. We have minx nails in many styles that will match all fingernail shapes and sizes. 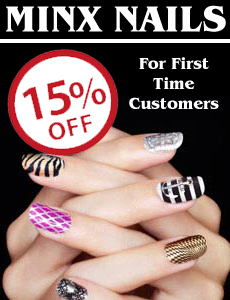 Our nail salon offers many varieties of minx nails and price ranges to fit anyone budget. Please call our minx nail salon in New York City for more information on how we can make your fingernail's much stronger and beautiful for a long period of time! Minx nails are a new nail polish alternative that heat bonds a thin film of color to your nails. Minx nails come in reds, pinks and mauves, but you can also get them in custom nail art designs where the nail is coated in all kinds of patterns including gold nails, chrome nails, silver nails and flower patterns. • Chemical-Less: Minx nails are great because they don’t required any additional chemicals being on your nails that might erode their strength over time. • Minx Nail art is ultimately endless in terms of possibilities. Anything you can dream of having on your nails is completely possible with how minx nails are created and applied to your nail tips. • There’s no waiting for Minx Nails to dry. They take longer to apply than nail polish, though, about 15 to 20 minutes. • The coatings never chip, so there’s no need to replace them until your nails grow out enough that it’s noticeable.